Step one: Find Out Key Cuts Depth. 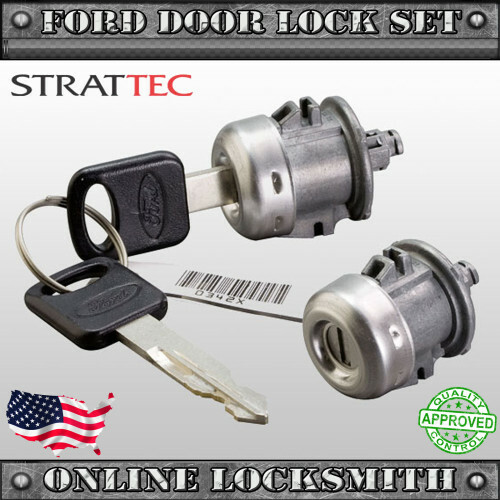 When you purchase an un-coded door lock you will need first to find out your keys depth values, Most Ford and Lincoln keys have 8 cuts blades. lets find out what are their values. Look at your car key, the hardest part is to recognize the depth of each cut. You should do it by looking at the blade, there are 8 cuts and 5 depth options while 1 is flat or almost flat and 5 is the deepest cut. Follow wafers will not jump more then 2 depth numbers different, If you think cut #5 is depth #1 cut the cuts before and after (#4 & #6) can be ether depth #1 / #2 / #3 it cannot be depth #4/#5 . Step two: Key the new lock cylinder. 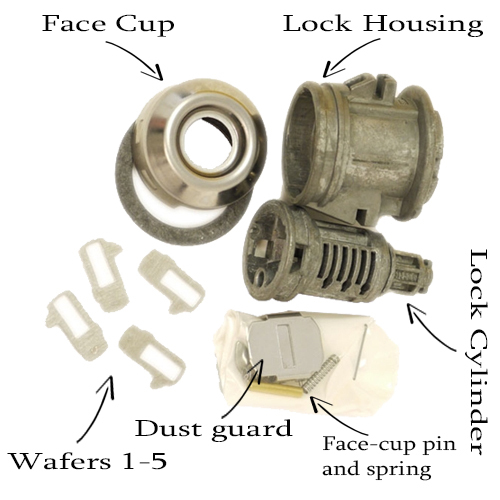 Open the new door lock kit and recognize all parts you received. In each slot you need to insert one small spring and the matching wafer (by the key cuts depth you found) the wafer should click in with a little pressure do not use too mach force to insert wafers there is only one way they can go in. when all wafers are in the cylinder and you confirmed you have all of them right (insert the keys and check they all go flat with cylinder) insert big spring and face-pin into the hole you find in the lock housing. the spring should pop half way out (it is use to hold the cylinder from turning 360*. Place cylinder into the housing it should slide in when you use the key to flat all wafers and insert the cylinder together with the key into the housing, when it is located perfectly in (all the way in) hold the cylinder in from it’s back part. you must place cylinder all the way down the housing to be able to click the face cup.